Allen is Allen. And Allen is a good guy. 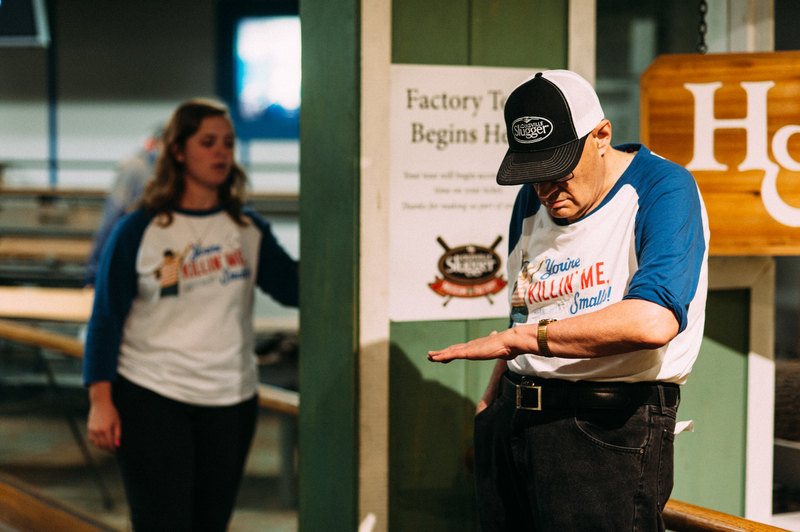 When you visit the Louisville Slugger Museum and Factory, and are ready to see the world-famous factory in action, Allen Walts might be waiting to make sure you are on time for your tour. Allen stands at the entrance, between exhibits that show how Louisville Slugger turns ash and maple trees into legendary baseball bats used by everyone from Babe Ruth to Derek Jeter to Joey Votto. Allen is welcoming, and enjoys saying hello to the regular line of enthusiastic kids who pass by his station. But he takes care of business, too, checking his watch regularly. He likes to make sure everyone is lined up for the right tour. 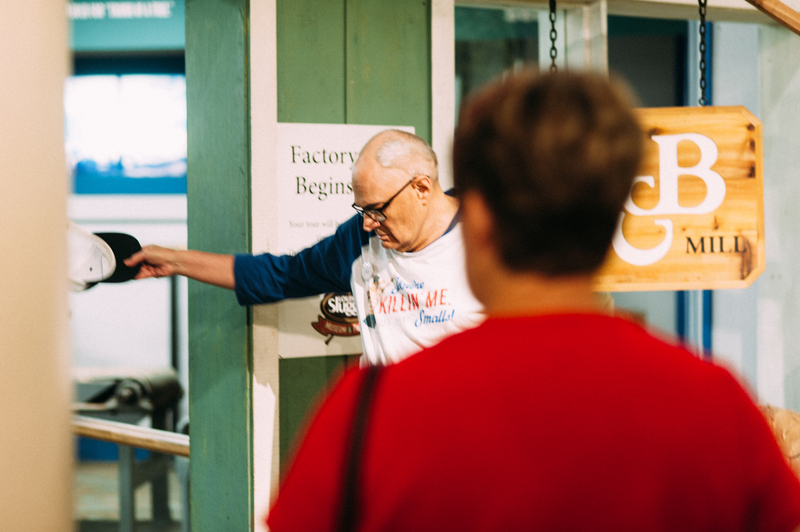 That’s not an easy job at a Louisville landmark that holds guided factory tours every five minutes and sees up to 3,000 visitors on busy Fridays when Allen is working. “Allen’s friendly and funny, but he’s serious about making sure everyone has their ticket and is on the right tour. He really helps our tour guides,” said Alex Sherrard, Allen’s Guest Services Lead. For Allen Walts, the job is more than a paycheck. It’s an opportunity and a challenge. Allen is a client of Volunteers of America Mid-States program for adults with intellectual and developmental disabilities. Allen is 65 years old and like many adults with disabilities, has had limited employment opportunities. Allen, who lives in New Albany, Indiana, had worked for a time in a sheltered workshop, doing repetitive tasks that didn’t allow him to interact with others or build new skills. Volunteers of America is working to change that, and is investing in finding fulfilling employment for the people we serve throughout the region. We provide comfortable, welcoming homes and around-the-clock support to adults with intellectual and developmental disabilities in Tennessee, northern Kentucky as well as Clark and Floyd Counties in Indiana. Kim Caballeros manages Volunteers of America’s Supported Employment program and thought Allen would be an excellent candidate for more challenging work. “Ideally, we want to get as many people as possible into meaningful employment. At Volunteers of America, we’re very passionate about finding more opportunities for the people we serve,” Kim said. Kim works with area employers to find good fits for our clients, giving them chances to learn job skills and gain confidence. Allen also enjoys earning more money. 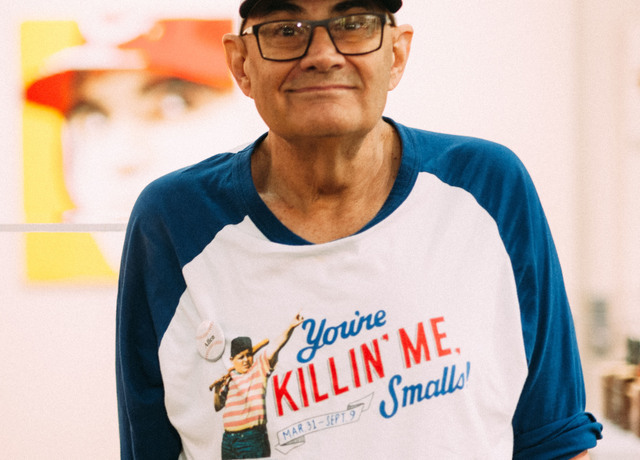 He earns more in one three-hour shift at Louisville Slugger than he did in a month at the sheltered workshop. But of far greater value is that Allen knows he’s part of the Louisville Slugger team. “Having Allen here is a win-win for everyone. Allen is a great fit for us because he’s a huge baseball fan and his enthusiasm really shines through,” said P.J. Shelley, Tour and Programming Director for Louisville Slugger. Allen’s team is the Cincinnati Reds, and he makes clear to his coworkers that baseball is his sport – not football. He likes to joke with his colleagues, sometimes taking off his Louisville Slugger cap to show that he doesn’t have much hair. Then he’ll suggest that his friends get a similar haircut. “I look forward to the days Allen is working. He’s really helpful, but it also brightens your day. You can’t help but smile when you’re around Allen,” said Olivia Scarbrough, a tour guide who works with Allen regularly. For adults with intellectual and developmental disabilities, finding opportunities to meet people and change their routine can be difficult. One of Volunteers of America’s fundamental goals is to help our clients become more independent and avoid loneliness. One of Allen’s best friends at Louisville Slugger is security guard John Williams. He is one of the first people Allen sees at work and they often exchange a salute. “That’s a gesture of respect. He’s always quick to help our guests and you can’t finda better person,” John said. “At first Allen was a little hesitant. Now, he’s waiting for me in his driveway every day, with his uniform and cap on, lunch packed and ready to go. He’s much more independent. It’s assumed that some work is just too hard for our clients, but Allen’s up to the challenge,” Kim said. His colleagues agree. Just ask John Williams.